Directory of American Sailing Association sailing schools located in Greece where you can take beginning to advanced sailing lessons. The Athens Sailing Academy is located in Athens Greece. We use the beautiful Greek Islands as our sailing back drop as we teach new students how to master sailing. The constant sunshine and easy winds make this an ideal location to learn how to sail. 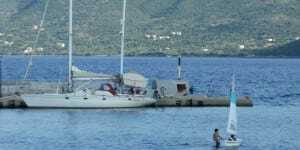 When the days sailing is over you will find your self on a new island every day, and a chance to explore the Greek islands while you learn how to sail. Fair Winds Sailing Greece is located in Corfu Island – one of the finest destinations in the Med with lots of sailing options in the Ionian Sea. The west Greek mainland and the Ionian Islands form an extensive coastline that provides countless protected bays and beaches of rare beauty, ideal for swimming, snorkeling and scuba diving.